Go out and discover a whole new dimension to reality. As early as 2006 Hoog+Diep collaborated with HP’s Personal Systems Group in the US and HP’s software developers in the UK to produce an augmented reality player for a wide audience; the Mscape player. The Mscape player plays mediascapes and communicates with Windows Mobile device’s internal and external sensors, including GPS, to provide to provide augmented reality services and entertainment. As the project’s interaction design expert Hoog+Diep challenge was to create a easy to use player for what was then a lab technology. The final (pre-iphone) design allowed even inexperienced GPS-device users to easily setup the sensors, select a mediascape and interact with it using just their fingers while walking outdoors. Mscapes overlay digital sight, sounds and interactions onto the physical world to create immersive and interactive experiences. Users equipped with a mobile device running the Mscape player can move through the physical world, triggering digital media – including images, text, sounds, audio and video – in response to physical events such as location, proximity, time and movement, making for experiences that are unpredictable, memorable and entertaining. Examples of famous mediascapes are interactive city tours, a GPS based pirate game and a virtual park ranger in Yosemity National Park telling about the plant life one sees walking across the park. Besides use by PDA owners, Mscape vendors – who lend out GPS-devices running a specific Mscape – can set the Mscape ready to go with the player in kiosk-mode, preventing users from accidentally leaving the Mscape. The project also included the design of a developer’s version of the player as part of the Mscape developer suite. Running on the same devices, it provides many in situ testing and debugging options – a must for any Mscape developer. 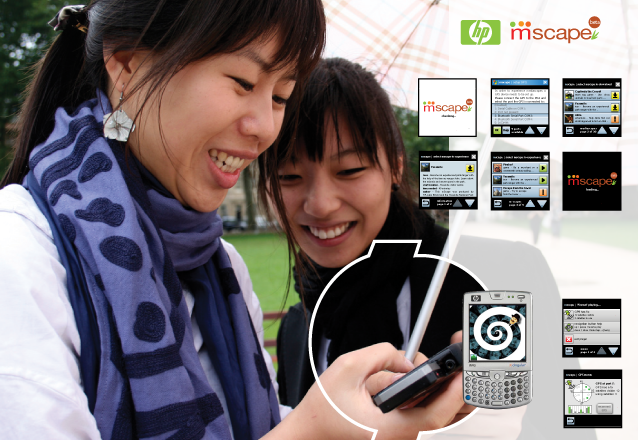 The Mscape player and accompanying AR development platform ran successfully at HP from 2006 till 2009 and is now continued by the mobile service studio and HP spin-off Calvium.